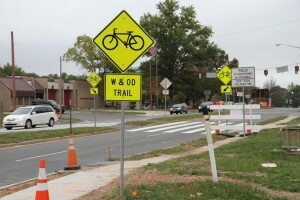 A planned pedestrian bridge that will move the W&OD Trail over — rather than across — Wiehle Avenue at Sunset Hills Road will take extra time to build because a half dozen electrical poles must be relocated, Fairfax County transportation officials said. The overpass will cost $10 million (money for it was allocated by the county several years ago) and will be completed by 2021, says Scott Ruffner, Fairfax County Department of Transportation Project Manager. Moving the utility poles will be an 18-month process, he said. “These are high-voltage poles that need extra time,” he said. The overpass is badly needed at the increasingly busy intersection of two of Reston’s main roads. In addition to the North-South and East-West main streets, there is a Fairfax County Fire and Rescue Station and a cluster of fast food restaurants. The intersection is also just north of the Wiehle-Reston East Metro station, which has parking for more than 3,000 cars. The overpass will make it safer for the pedestrians and cyclists on the trail. They currently cross Wiehle in a crosswalk. There were seven reported crashes there from July 2011 to June 2015, some vehicle vs. vehicle, others vehicle vs. trail user. FCDOT officials say they see a variety of behaviors at the intersection. Some drivers are cautious and slow down for pedestrians. But others are confused, oblivious and careless, said Ruffner. FCDOT is looking at two configurations for the trail leading to the overpass — a 3-percent grade or a 5-percent grade. The 3-percent footprint (easier for cyclists) is much longer and will take the project and its associated utility movement all the way from Isaac Newton Square to Michael Faraday Drive. The plan includes access down to Wiehle in case users want to leave the trail. The street-level crosswalk will be closed when the bridge is completed. The sidewalk on Wiehle will also be widened, officials said. FCDOT is seeking public feedback about the bridge’s potential design elements. See more information and find out how to give your feedback on Fairfax County’s website.